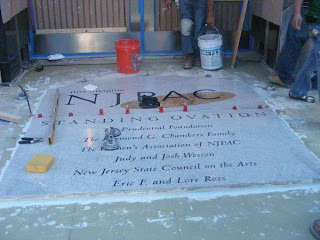 A picture of the installation of a 55' diameter medallion installed in the Newark, NJ Performing Arts Center, Installation materials from Laticrete (of course!). Installed using the Tuscan Leveling System for the "plumb & true" setting of the slabs. Creative Edge for the waterjet cutting. Installation materials include HydroBan for crack suppression, Laticrete 220 marble and granite medium bed mortar, SpectraLOCK "Stainless" grout.